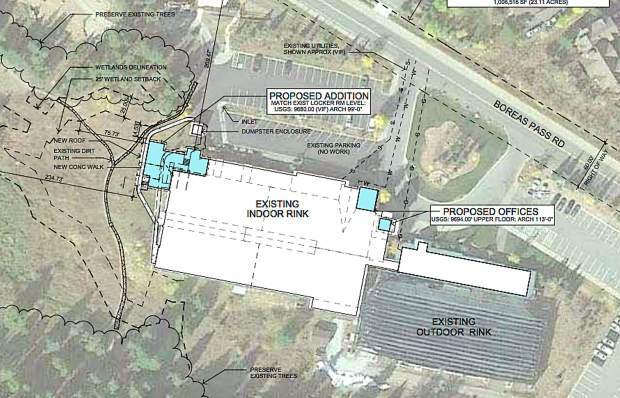 This rendering shows potential additions at the Stephen C. West Ice Arena in Breckenridge, including the addition of two locker rooms with their own showers and bathroom facilities. Cramped quarters at the Stephen C. West Ice Arena have Breckenridge considering a $2.5 million renovation that would add two large locker rooms that user-groups and town officials say are sorely needed. With the town’s planning commission holding a public hearing Jan. 29 and deciding to recommend project approval, Breckenridge Town Council is scheduled to weigh the potential renovation that comes with a $2.5 million price tag Tuesday. “I know it’s an expensive piece, but it’s a great build for the future,” said Chris Miller, the director of Summit Youth Hockey, which rents out ice time at the arena with two different sheets of ice. Just for practices, Summit Youth Hockey can have six to eight coaches on each sheet, and those coaches usually need a place to change before practice, Miller said. With two rinks, that equates to about 12 to 16 coaches all needing changing rooms at once. But they just have one small trainers room to share amongst them at the arena, Miller continued, adding that accommodating the organization’s actual teams can be just as problematic, especially when it comes to having adequate facilities for both the program’s male and female athletes. For the co-ed teams, the lack of locker rooms at the ice rink space raises a question about where the girls can change into their gear. With two indoor locker rooms at the arena, there’s only one per team and that leaves any girls on the squads cramming into a small family bathroom, Miller said. Additionally, when there are male and female teams trying to play games at the same time, the two existing indoor locker rooms aren’t sequestered as well as they should be, as they share shower facilities, and that has raised other gender issues, as well. Under the proposed renovation, the new locker rooms would have their own showers and bathroom facilities. Aside from gender issues, the existing locker rooms are just too small for the people who are frequently using them. Miller said each existing locker room can typically accommodate about 10-12 hockey players — maybe 15 for the younger teams — and the result all too often is a free-for-all with players changing in the hallways, bleachers or wherever they can find room to get ready. In addition to adding two new, larger locker rooms, the renovation plans currently call for a new “referees room” with its own restroom facilities, a storeroom, mechanical room and two new second-floor offices. The town’s also considering adding some more rental lockers, a new exterior stairway and path, some site work and landscaping, and additions to the building’s mechanical, electrical and plumbing systems. The players and coaches have been good sports about the lack of facilities, Miller said, but having coaches and players changing outside locker rooms is less than ideal. The new office space wouldn’t be reserved for Summit Youth Hockey, but it would help give the hockey program somre more room to work and Miller said that would be a great benefit to the program, as well. And while crunch on work and locker room space is bad now, Miller said the Summit Youth Hockey program has grown about 20 percent each year and the rising numbers are not expected to wane any time soon. In fact, since the organization created a program to give beginner hockey players ages 8 and under the chance to participate in the sport with all the equipment provided free of charge, the organization saw its youth program for that age group balloon from 50 to 93 players. If these children continue playing hockey as they grow into older age groups, that will mean more even teams and a greater need for locker room facilities to accommodate them. Another piece of the proposed renovation is one of efficiency, explained Scott Reid, Breckenridge’s director of recreation. In many cases, one team has to get off the ice and out of the locker rooms before another one can get in them. With additional locker room space, Reid said, the arena could better juggle these teams and free up some ice time in the process. The proposed addition has been discussed for years, Reid said, but town staff started working on designs for a potential addition in the late summer or early fall at town council’s request. The $2.5 million price tag is based on incomplete designs, but town staff note in a memo to council that it’s better than previous cost estimates. Depending on how council wishes to proceed with the project, if at all, and as designs are completed, that figure could change, Reid said.